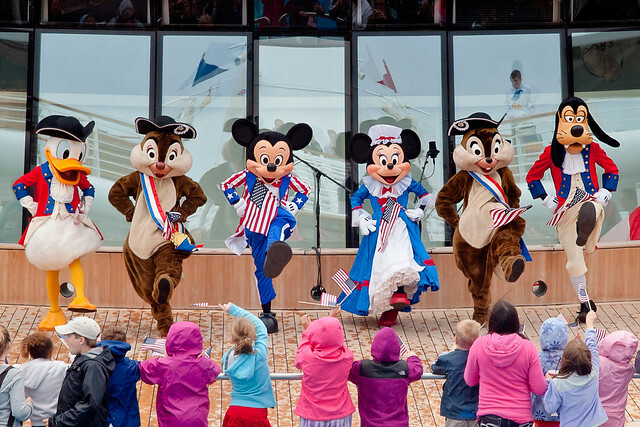 Are you wondering whether a Disney Cruise Photo Package is worth it? You may want to capture the magic of your vacation with a Disney Cruise Photo Package, but a lot of people get confused about how it all works. Here is our complete guide to all the options of the Disney Cruise Photo Package to help you decide if it is worth it. Learn some things along the way which will help you make the most out of your Disney Cruise Photo Package. Even in the Disney cruise port terminal, you will have your first chance to have a picture for your Disney cruise photo package. 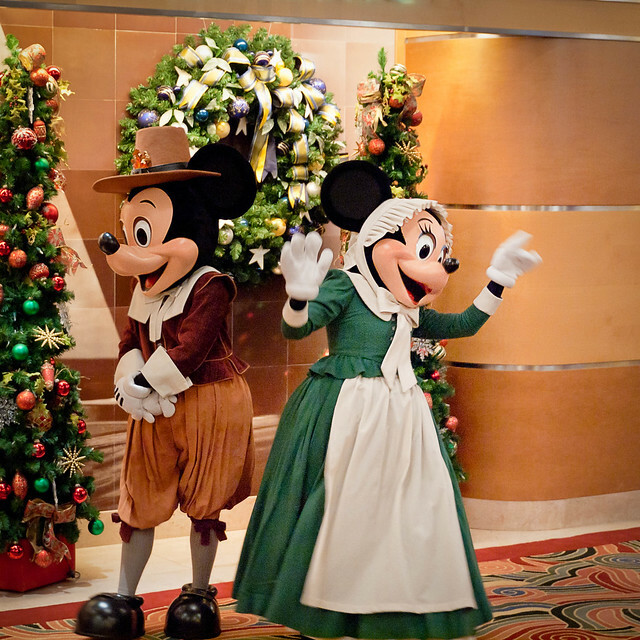 Mickey and Minnie Mouse will be there for you while you are waiting to board. When you board a Disney cruise the first thing you do is hand your Key To The World Card to be swiped to show you have entered the ship. The second thing you will do is encounter your first Disney Cruise Photographer! They are stationed at a strategic position right before you get on your Disney ship. I have to confess I am not the most enthusiastic person about stopping for that embarkation photo. However, it is often the very best one we have taken for all the cruise. 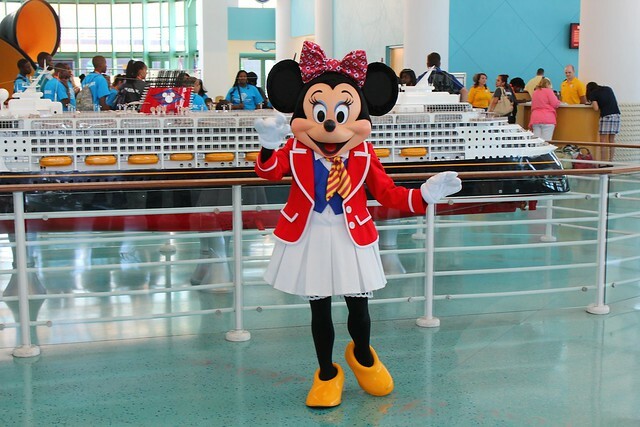 Disney cruise lines outsource their photography to Shutters. I kind of wish they wouldn’t because they are just not quite as magical as the Disney cruise line crew members sometimes. However, I have to say they mostly do a great job. They are everywhere on the ship. Every character greeting you go to you will find a photographer. You can always use your own camera. However, there will also be a professional on hand. They also set up lots of photo backgrounds around the ship. You can even have your photo take with the captain on certain sailings! You can see which backgrounds they are setting up so you can choose which one you like. The lines for photography on formal night on a Disney cruise are always the longest. If you want a formal night photo be aware that you may be standing in line for quite a while. 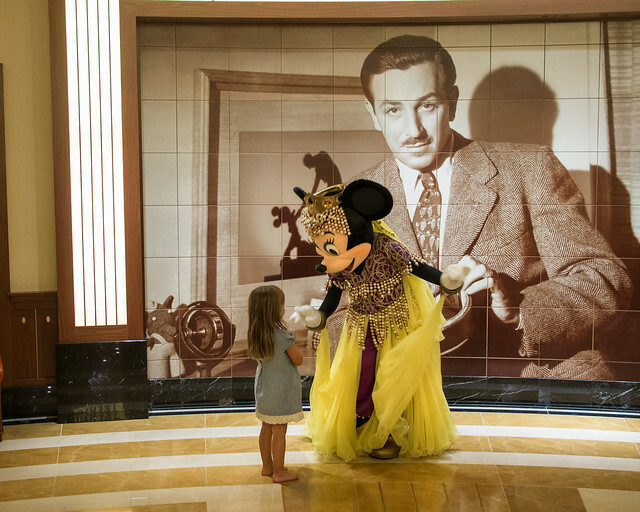 How Do You Find Your Disney Cruise Photos? Disney makes it very easy for you to see your photos. On every ship on Deck 4 there is a Shutters photo area. There you will find digital kiosks where you can view your photos. All you need to do is swipe your Key To The World and all the photos which are in their system will be displayed. How do they know who you are? They have a digital facial recognition system which in theory puts all of your photos in your account so that you can view them on the kiosk. I say in theory because it doesn’t always work. If you think that photos are missing the Shutters staff can help you find them. Just enquire at the desk. Another way to make sure that your photos definitely make it into your account is to hand the photographer your Key To the World Card. This then links the photos with your account. All of your Disney cruise photos used to be printed out. This is not the case anymore. They have gone fully digital and your photos are all available to view on the Shutters kiosk. This is located on Deck 4 of all of the Disney ships. Are The Disney Cruise Photos Any Good? Photos are of course an amazing way to capture the memories of your Disney Cruise. My house is filled with photos from past cruises. The photographers are generally good. Not outstanding. However, given that they are working quickly and often with very large parties, they do a good job. They have the advantage over you in that they have worked out the lighting and the best angles. You really should have as many photos taken as you can just so you can see which ones you like. Having said that I am not a big fan of the backgrounds that Shutters use sometimes. The borders around the photos are often just not my taste. Unfortunately, you do not have the option to choose to remove or change the borders. I am not sure why in the age of digital ease but you get what you are given with the borders. I am sure that one day soon that will change but at the moment there is no option to choose a different one. It’s great also that you actually get a complete family or group photo. I know that there are such things as selfie sticks but nothing beats a great photo of the whole family having fun on a Disney cruise. If Minnie Mouse is with you then that’s even better! How Do You Buy Disney Cruise Photos? There are a number of ways that you can buy Disney cruise photos. 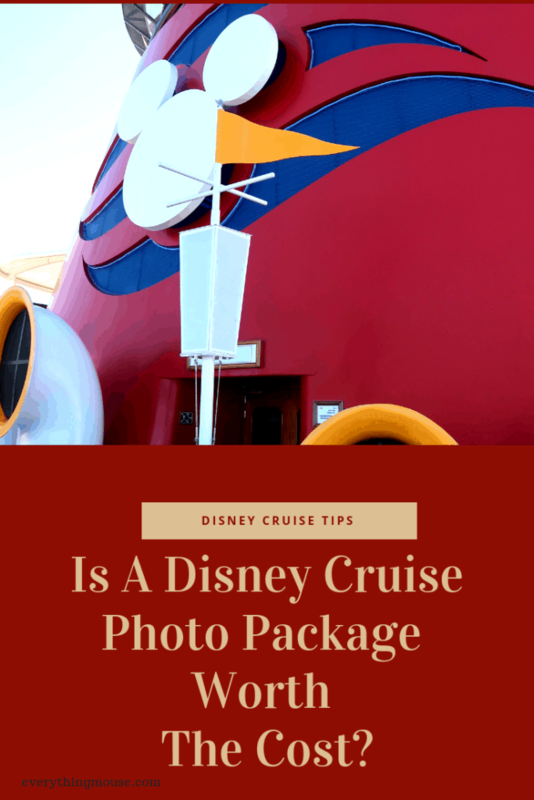 If you know you are going to want a Disney cruise photo package then the best way is to purchase it online before you sail on your cruise. You can do this up to 48 hours before you sail. See below for prices and the Shutters website. You can also buy a package or individual photo at any time that the Shutters desk is open. Just like anything on a Disney cruise, the amount will be charged automatically to your onboard stateroom account. What you absolutely must do is to purchase the photos that you want whilst you are still onboard your Disney cruise. Once you have left the ship it is too late. There is no going back to reorder! My advice is to choose whatever photos you want prior to the last evening on the ship. If you try and buy on the last evening of your cruise you are going to be with crowds of people and wait in a long line. Just really try and avoid it. That is not how you want to spend the last evening on your cruise. This is where people get very confused. However, it’s simple if you break it down! Often families or groups stay in more than one stateroom on a Disney cruise They want to know how to make the Disney cruise photo package work most economically for them. The general rule is that it is one package per stateroom. Say you have one stateroom with your kids and the grandparents have a separate stateroom. This is a pretty common set up on a Disney cruise. However, you can’t combine a Disney Cruise Photo Package with two staterooms (with certain exceptions I will explain below). Say for your embarkation photo you have a group photo with all the family. Parents, kids and grandparents. Just the parents get the package. The picture will show up in the parents and the grandparents account on the Shutters kiosk. The facial recognition or the swiping of the Key To The World will make sure they know who you are. However, if the parents have bought a package they can get it for their account. The grandparents can’t. If the grandparents decide to get a photo just the two of them it will not be on the account if just the parents bought it for their stateroom. Remember. It’s about the stateroom, not the group. However, if the grandparents decide to get a photo with the kids, that photo will be included on the parent’s stateroom account. It’s all about who is in the photo. The package is exclusive to the stateroom but just so long as someone from that stateroom is in the picture and you have bought a package, it will be available as part of what you bought. There is an exception. A lot of families travel with parents in one stateroom and kids in another. Just so long as there is one person over 18 in each stateroom this is allowed. The exception for kids being in another stateroom is for any “children” aged under 21. This is a great exception if you are traveling with older offspring as well! If you have 2 or more staterooms and your children aged 17 or under are in a stateroom they will be included in the package. That’s easy. How does this work? Let’s say Dad is in one room with the 5-year-old and Mom is in the other stateroom with the 12-year-old. If Mom or Dad had a Disney cruise photo package linked to their stateroom, pictures from both staterooms would be included. To make sure this works you do have to visit Shutters on the first day of your Disney cruise. They can explain what the position is. There is another way to get a discount if your family is traveling in 2 staterooms. The first stateroom can buy the Disney cruise photo package online.Then once you get onboard the second stateroom family can buy the package at a 50% discount. However, this isn’t quite as good as it sounds. This is 50% of the onboard price. Therefore you do not get 50% off the online discounted rate. You get 50% off the higher price onboard. It is still a discount. Just perhaps not as great as it seems at first. How Much Do Disney Cruise Photo Packages Cost? If you decide you want to buy the digital image package and not the prints you will be given a CD. This CD will then show you reasonable size proofs of all of the photos you had taken. You can then choose which photos you want and choose the number of images you have paid for. You can then unlock the full resolution images and print them as you wish. You will get your photos on the last night of the cruise or the final morning before you disembark. Note that these prices are for all your photos on USB. They will not be printed out for you. You will have printing costs on top of this when you get home. Another great option is the Disney Cruise Photo Book. The price if you buy it online at OurCruisePhotos is $139.95. You can add up to 34 photos in your Disney Cruise Photo Book. This is a really good way to make sure that you get a good selection of your Disney cruise photos to keep. It’s a lot of fun putting together your Disney Cruise Photo Book. You can do this at the Shutters kiosk. It’s easy to change photos in and out of the book and arrange them on the page as you want to. Don’t leave this until the last moment. The Shutters area on the Disney ships is very crowded on the last evening. Don’t leave it that late. I suggest that you keep looking at your photos every day so you know what is there and start arranging them in the Disney Cruise Photo Book. You do not want to be leaving all of this to the last evening of the cruise. Shutters will be crammed full of people on the final evening and you may feel pressured to get it done. It’s a lot easier to do it a bit at a time. You can always rearrange things if you get photos that you prefer. I actually think that the Photo Book is a reasonable option as you do get to have a lot of printed memories for a reasonable price. However, if you prefer to put your pictures on display this is obviously not the best option as they are all in a book. A Disney Cruise Photo Package is pricey. There is no denying that. Some people think it is an amazing value. Others think it is a huge expense. Only you can decide which view is your view. However, if you do decide to get the Disney Cruise Photo Package there are ways to make it more valuable. How? By getting more photos taken. It is one thing to pay $349.95 for 10 photos on a disk but quite another if you get 100 photos! 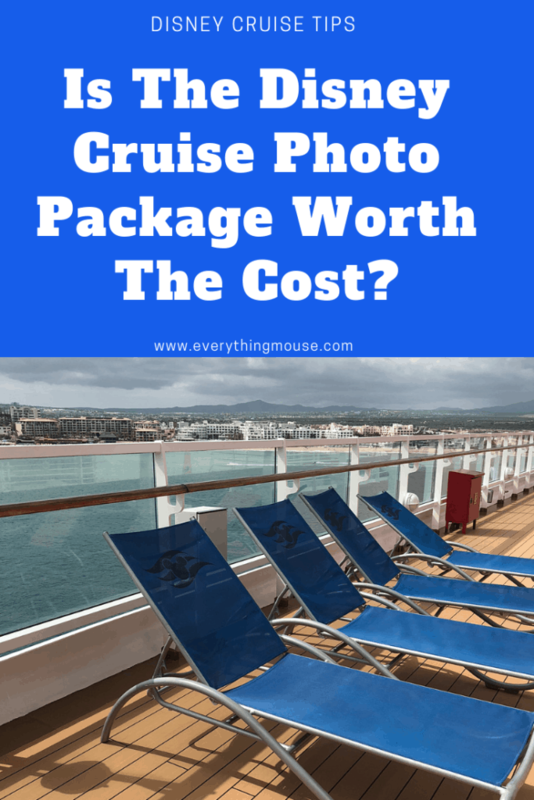 How can you maximize the number of photos in your Disney Cruise Package? There are so many photo ops you really can go all out and maximize it. We have heard of guests having 800 photos on a 14-night cruise. Not sure if you would actually get a chance to sleep if you were having your photo taken that many times. However, it definitely is possible. The secret is planning. You know that every day on the cruise there will be photographers out setting up backgrounds. These are on Deck 3 of all the ships. Go and take a walk before the first seating of dinner and see what your options are. Arrive early so you minimize the time spent in line. Sometimes the photographers will be in your rotational dining room. They always suggest what pictures they take. For instance, they may say a photo of you as a couple, as a family and then separate photos of the children. Ask for what you want. If you want extra ones tell them. It is not going to take much extra time, but it will mean that you get more photos in your account. Disney photographers are even found on Disney Castaway Cay.. You may be floating along in your inner tube in the ocean and see a photographer approach. Go and seek them out. If you want a family photo then set one up. Photo of you and your significant other? Ask for one. The photographers want to sell as many photographs as possible so they are happy to oblige. In my experience, a lot of people ignore them on Castaway Cay. So go for it. 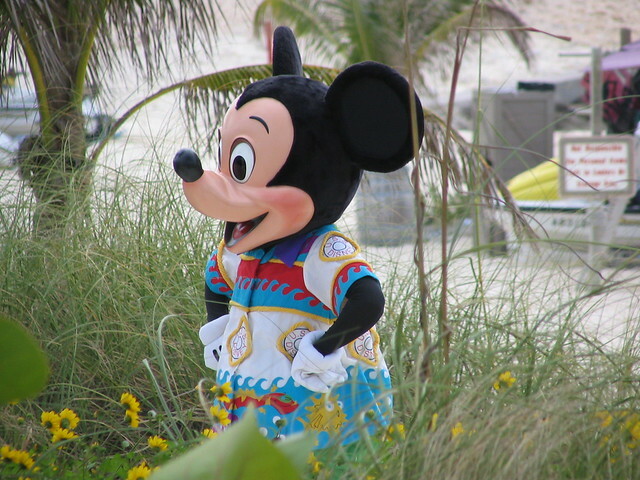 You may get a great Castaway Cay picture for your Disney Cruise Photo Package. 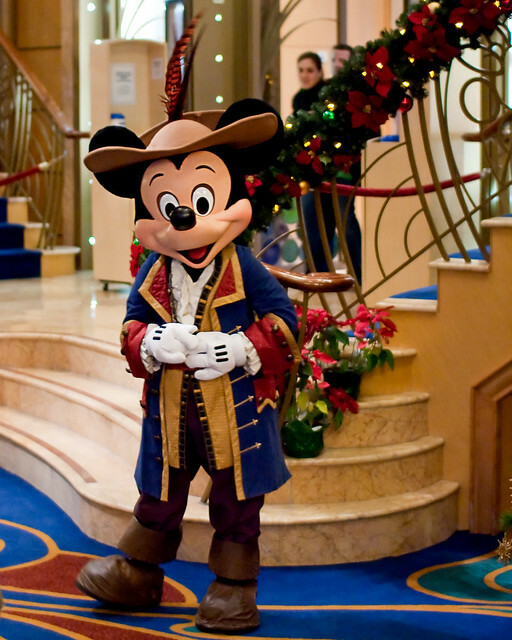 Character greetings are often the best chance you have to get a really great photo for your Disney Cruise Package. Every day the character greetings are posted in the printed Navigators you get in your stateroom every evening. If you want to be even more organized and plan further in advance use the Disney Cruise Navigator App so that you can see where the characters will be more than one day in advance. Mickey and Minnie appear most often is lots of different costumes. 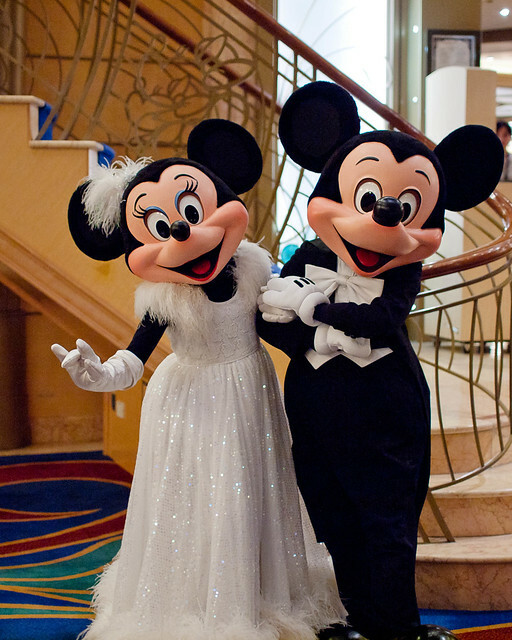 I love the Golden Mickeys costumes for Mickey and Minnie. However, if you want to have your photograph taken with one of the more minor characters, say Peter Pan or Captain Hook this takes a little more planning as they don’t appear as often. 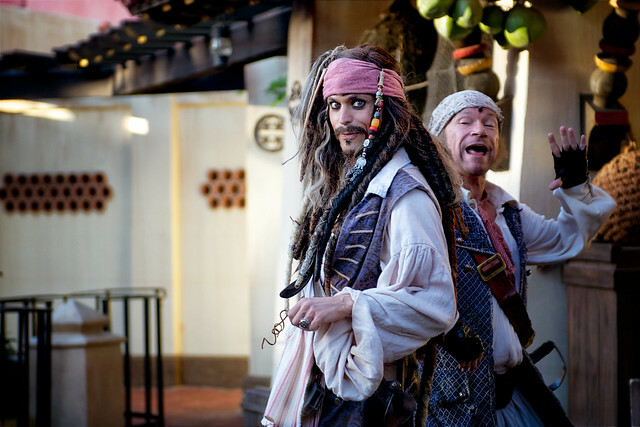 If you have your heart set on a photo with Captain Jack Sparrow he appears on Castaway Cay as well as on Pirate Night. You do need to plan ahead to seek out the Disney characters which appear less often. It is so much easier to get a picture with a Disney character on a cruise than at the Disney parks. You can wait for less time. In air-conditioned comfort. Make the most of it and get as many photos as you can. Then the value of the Disney Cruise Photo Package really kicks in. 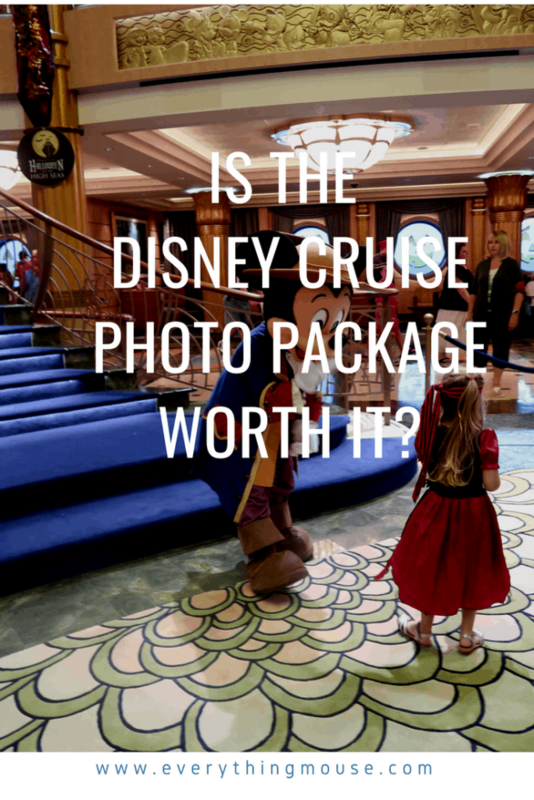 Will you be buying a Disney cruise photo package? Let me know in the comments below.